The BETA Men Need You! In the shadows of World War II, another war is being fought. This is a war the public know nothing about... a war that threatens all of mankind. Invaders from beyond space have set their sights on our planet, and it's going to take superheroes to stop them! Only one team of operatives is equipped to handle trouble like this: The BETA Men! A team of special forces dedicated to investigating and countering threats from outside, the BETA men are ready for anything. But they'll need the help of some superheroes to get the job done. The BETA Men is written by Jack Norris for the Mutants and Masterminds Third Edition Role Playing Game. Artwork is provided by Alex Williamson and Denise Jones. Included you'll find an extensive brief on the Bureau of Extra-Terrestrial Affairs (BETA), summarizing their membership, history, and equipment. Everyone from leader Dash Freeman to the intellectual super-simian Professor Trinazet is given spotlight status with full stat blocks and entries. Also inside are the guidelines for running an Invasion campaign, breaking everything down into stages. An innovative Victory Point system helps give the players a currency they can use to help determine the course of the campaign. Finally, we outline three example sets of invaders. Will you confront the Lokkus Horde and their horrifying biotech, the mysterious size-changing threat of the Triffling Empire, or the self-proclaimed master super-race of Das Übermen? You'll find histories, artwork, motives, plot seeds, and artwork for each set of invaders. Each one can be a campaign on their own, or string them together for a mega-sized campaign to save the earth on multiple fronts! Join forces with the BETA men, and take a stand for all of humanity! 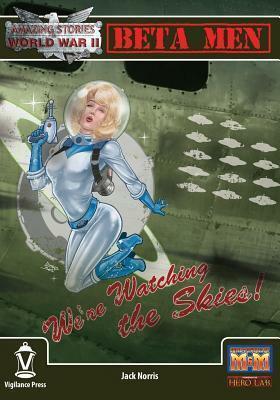 We're Watching the Skies!